How To Select Your Automated Gate & Access System. Your ultimate system design guide. An automated gate and access system can be as simple as pushing the button on a garage door opener to open and close your gate. It can be as sophisticated as a computerized entry and vehicle proximity reader where your system knows your car and automatically opens the gate as you approach while recording, managing and sharing every transaction. Part one of this How To article is to review the types of gates relative to how these gates accommodate your site. There are two basic types of gates that can be easily automated. Cantilever slide gates and swing gates. Swing gates are more popular in residential applications. Home owners prefer the look of the estate type entry where the gate swings open to welcome you. These gates are available in both single and double drives. Some considerations if you have selected an automated swing gate. Consider if the gate should swing in or out. Automated swing gates may swing in or out. However, the vast majority swing out. This is because most drives slope down from the house to the street. Swing gates must remain level as it swings open. If the gate is swinging in, it may bottom-out on the drive before it swings all the way open. This may be an issue if your approach from the street to the gate is short. There should be at least two car lengths as guests are prone to back-up when they see the gate open out. If there is not enough distance from the gate to the adjoining street, guest may be backing-up into traffic. Consider a double drive gate over a single swing. Single swing gates only require one gate operator. Double drive gates will require two gate operators that must communicate with one another. Though the cost of two operators is more expensive, a double drive gate will have a much shorter swing due to the gate opening being split between the two leafs. This has multiple benefits. A larger single leaf may require a larger gate operator compared to powering two smaller leafs. Automated swing gates may serve as snow plows in the winter. The larger single leaf may struggle in pushing even a couple inches of snow. If you gate opens out, two smaller leafs will be less intimidating to guests when the gate begins to open out toward them. Thus, first-time guests may be less prone to panic and hastily back-up into another vehicle or on-coming traffic. Consider all the elevations. A 20’ opening with a single gate leaf means that the leaf will extend over 20’ of drive both in the open and closed position. If there is any slope, the leaf may bottom-out as it swings open or leave considerable gaps under the gate when in the closed position. If the opening is split between two 10’ leafs, any gaps or concerns of bottoming-out are minimized. You should verify the elevations of the ground beneath the entire travel of the gate. The highest elevation will be your benchmark. The gate will be set a couple inches above this elevation. This could leave the gate a considerable distance off the ground in the closed position if the ground slopes up as the gate travels open. This is common as most site elevations travel upward from the street to the building. Consider the sweep or swing of the gate. Swing gates will cover a lot of ground when swinging from the closed position to the full open position. This sweep may interfere with other items such as traffic lanes, parking stalls, parked cars, etc. Many swing gates will open a full 180 degrees which allow you to store the gate against the fence line when open. This is good news until you have to close gate and it must swing through a parking stall occupied by a park car left overnight. Consider the more secure option. Automated swing gates may not be as secure as automated slide gates. Unless equipped with an electric mechanical or magnetic lock, automated double drive swing gates may be easily pried-open to allow someone to squeeze between the two leafs. Slide gates may be equipped with a receiver that allows one gate to slide into another or into a receiver post. This makes it very difficult to pry open the gate. Slide gates may be more popular in commercial applications where security and reliability are paramount. Slide gates are available in both single and double drive applications. If you are thinking about a slide gate for your business or home; you should consider the following. Consider the storage. Slide gates are typically 50% larger than the actual opening. So, a 16’ opening would require a 24’ overall gate leaf. This extra 8’ of gate is called the tail or counter balance. It also allows the gate to be easily attached to a slide gate operator. If selecting a slide gate, you must be sure that you have adequate storage for the gate in the open position. Consider all the elevations. Slide gates must be installed level in accordance with ASTM F 2200. This is critical so that the gate does not slide under its own weight which could cause a significant injury. That being necessary, you should review the elevations of the ground below the entire travel of the gate from open to closed. The highest elevation will be your benchmark. The gate will be set a couple inches above this elevation. If the highest elevation is at the tail of the gate and it slopes down through the opening, the gate could be several inches to a foot off the ground at the opening. Once you have decided on the type of gate between a swing and slide gate; you are ready to choose the style of your gate. Both cantilever and swing gates can be designed as a simple means of security that includes chain link fabric over a galvanized framework. Both type of gates can be highly ornate to include decorative pickets, finials, circles, letters and custom designs. There are literally thousands of different designs. However, each design may impact the overall size and weight of the gate. These two factors will play a significant role in the selection of the gate operator. In accordance with ASTM F 2200 and UL 325, there are some gate design considerations that should be closely adhered to avoid any unnecessary hazards. The gate should not have any obstruction or design component protruding out from the gate that may create a hazard below 8’. Slide gates should not have openings greater than 2 ¼” in the gate. All gates should have a smooth bottom with no pickets protruding. All gates should be prevented from falling if disconnected from the gate hardware. Swing gates should not create an entrapment area less than 16” when swinging open. Swing gates should not have an area greater than 4” from the post or column to the hinge point. Gate receiver hardware should not protrude out into the opening. Gates should have a positive stop at the full open position. Now that you have selected your type and design of gate, you are ready for part two of this How To article: How To Select Your Gate Operator. Gate operators are designed to move gates in two directions. This requires an electric motor. The bigger the gate, the more powerful the motor application. Gate operators are manufactured to meet specific gate design characteristics. These include gate size, weight, wind loading and frequency of use. Each gate operator manufacturer provides an easy to use chart that assist you in selecting your gate operator based on these characteristics. Size. The overall size of the gate is generally the leading characteristic in determining your gate operator selection for both swing and slide gates. Weight. Unless you have a very custom ornamental gate with a lot of heavy infill; you will rarely weight-out your gate before you size it out. Wind loading. Wind loading is rarely addressed by manufacturers but it is a real concern. If your gate as a solid opaque surface that receives heavy winds, rain or snow; you may want to contact your local gate operator installer for recommendations on oversizing your gate operator. Frequency of Use. Most gate operators today are continuous duty operators. However, some DC versions have limited use due to battery life. Once you have narrowed down your gate operator selection based on the above performance characteristics; you must select your operator on three more important electrical criteria. Before doing so, you should identify where you are going to pull power for your gate operator. Gate operators require a dedicated circuit and required number of amps. Do not attempt to daisy chain your gate operator into other applications. The amount of start-up power for an electric motor is substantial so it may easily trip the breaker when combined with other usage. Gate operators are available in single and three phase power. Three phase power is preferred because it is a more efficient and consistent form of power. Your facility may have three phase power but not in the front of the building where the administrative offices are located. Thus, you may have to pull this power from the rear of the property where it is located to power machinery. Single phase power has one hot and a neutral whereas three phase has three hots and a neutral. Thus three phase wire is expensive. Gate operators are available in a range of common voltages. 120, 240, 208 & 460. You should always make sure your circuit is designated within 10% of the gate operators rated voltage. Now you have selected your gate operator based on the performance characteristics and electrical requirements. 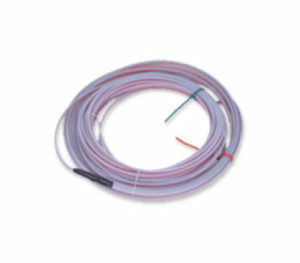 Closely follow the manufacture’s recommendations for installation. Having successfully installed over ten thousand gate operators, there are some key pointers we would like to mention. Gate operators require proper anchoring, footings, and mechanical connections. Please consider using a professional installer to set and connect your gate operator. The location of the gate operator relative to the gate is paramount. Closely follow the manufacturer’s recommendations for these dimensions. Even the slightest variation may result in operator failure and create a safety concern. Only use a licensed electrician for bringing power to the gate operator. Like any piece of motorized equipment with circuitry, gate operators are very fickle about meeting the required number of amps and voltage. Too little or too much may cause you to quickly blow a circuit board or motor. Electricity drops-off when traveling long distances. Since most gate operators are located several meters from the power source, a licensed electrician will help evaluate and provide the proper wire size and starting voltage for the distance travelled. Gate operators require inherent and external safety devices. The operator will not function unless these devices are properly installed. Gate operators require programming prior to operation. Follow the manufacturer’s step-by-step procedure in properly programming the gate operator. Today’s gate operators are sophisticated pieces of equipment. However, this equipment will not operate without additional external control devices that are not included with the gate operator. There is a wide range of access control components. To help you narrow down your selection specific to your application, you should consider the following approach in the design of your system. The first item to consider is if your gate will be secured during business hours. Regardless if a residential or commercial application, you must decide if your gate will be open or closed during the day. “Day” in this instance can be defined as business hours or that period of time when you would reasonably expect non-family members to need access through your gate. This may appear to be an unusual place to start the decision-making process, but it is a critical first fork in the road in selecting your access control devices. 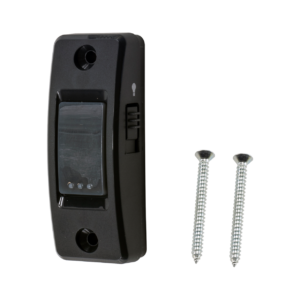 Gate access control systems that are closed during the day or business hours will typically require some form of point of elevated entry communication device that communicates with others via cell phone, landline or intercom. In addition to the ability to communicate, these devices will also include point of entry access via keypad, remote or card reader. These devices include telephone entry devices, intercoms and computerized devices. If your gate is open during the day, you may consider basic access control devices that do not communicate with others. These devices may be standalone keypads, key entry, push button and card readers. The next consideration is the type of individuals who will require access through your gate while it is closed. Please consider if you need access for the following individuals. Family members or key employees. These are typically individuals who are given fully 24/7 access through the gate. These are individuals who are given restricted access based on scheduled regular time periods. Scheduled services. These are individuals who are given a limited number of access attempts for limited access periods. These may include cleaning services and the infrequent repair events. The individuals are limited to use the access code for a specific number of usages. Guests and non-scheduled services. These may include one-time guests who may or may not have scheduled a visit, postal delivery, food delivery, etc. The next step in the selection of your access control devices is that entry and exit are reviewed separately. In other words, how each individual gains access to enter the property may vary from how they exit the property. Exiting the gate may not require the same level of scrutiny in deciding if the individual can open the gate. This will save greatly on costs and time. Standalone devices: Standalone devices are not connected to other devices. These devices typically are used to control a single gate. Standalone devices are typically more cost competitive but also very limited in programming options and generating any reporting. Most standalone devices are programmed at the unit. Most importantly, standalone devices rarely have the ability to be tied to a single user and are not given a user ID. A standalone keypad is connected directly to the gate operator. The most common applications are single family dwellings and business with limited after-hours access. Computerized Programmable devices: Computerized devices typically communicate and are connected to a master controller. These devices can be connected to multiple other devices and gates. These devices may be programmed via personal computer connected to the master controller via the internet. Multiple users may be set-up in the master controller to have defined levels of access by gate and time zone. These computerized devices will also have a reporting mechanism where the controller is saving every entry and exit by each user. Often, these reports can be formulated by user, time zones, and gate. The most common applications are apartment complexes and gated communities. Access control devices are available in both standalone or computerized programmable. If you have given some thought to if your facility must be secured 24/7 and the various individuals who will need access to your gate, you are now ready to select your access control devices for entering and exiting your automated gate. Below a cursory list of the access control devices available today. The most widely used access control device is the transmitter and receiver. The transmitter comes in a wide variety of options. 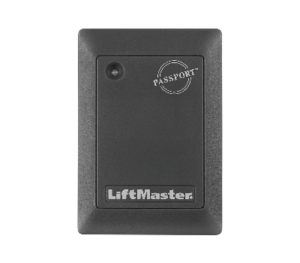 Most commonly known as a “garage door opener,” the transmitter is typically a small device that clips to the visor. One push and it sends a radio signal to a receiver in the gate operator. Once the signal is received and verified, the receiver sends a message to the operator to open and/or close the gate. Transmitters can be single channel or multichannel to control several devices. Many of today’s automobiles are equipped with a “Homelink” transmitter system that may be programmed to open your gate operator. There is even a handsfree device that automatically opens the gate when you approach without having to push any buttons. 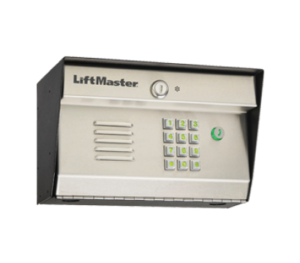 Another widely used device is the pedestal mounted keypad. As a standalone device or computer programmable, the keypad requires a 3-5 digit code to access the gate. A single code may be used for all access attempts or individualized codes may be programmed to provide better security. The downside to a keypad is that codes may be shared with no limitations. A programmable keypad can track these codes and respective entry attempts. For greater security, a popular option is a proximity card reader. As a standalone device or computer programmable, the card reader requires cards be given to those that require entry. You simply swipe the card in front of the pedestal mounted reader device. Once the card is verified, the gate can be accessed. Individualized programmable cards and card readers better control access and track access attempts. A simple solution is a standalone key switch. Those that require access will be provided with a key. A momentary contact key switch will require you to twist the key, release and remove. A signal will be sent to the gate operator to open or close the gate. A constant contact key switch will require you to twist the key to an open or closed position and then remove. This will send a constant contact to the gate to open and keep the gate open until the key switch as been returned to the closed position. Lost or stolen keys will require you to rekey the device. For those not necessarily concerned about security but want a gate that is closed to keep pedestrians from making a wrong turn, a simple push button may be enough. Push buttons are available in a single button to open and close the gate. A two-button device with one button to open and one to close. A three-button device with one button to open, one to close and one to stop the gate. All of these button devices are available with a lock-out key device. Often times these button devices are placed out of sight. 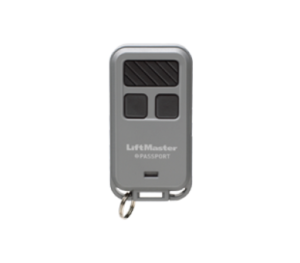 Ground loops are an excellent hands-free means to opening and closing gates. More than likely, these loops are placed on the inside of the gate. This allows for vehicles to pull-up on the loop to signal the gate to open. These interior loops used to open a gate are called “free exit” loops. A third type of loop is used to keep an open gate open and reverse a closing gate to the fully open position. These loops are called “obstruction loops” and are most commonly used to prevent a gate from closing on a vehicle. A fourth type of loop is a “shadow loop.” These loops keep an open swing gate open or prevent the gate from opening. Shadow loops are not operational as the gate passes over the loop, thus not sensing the gate and reversing. Loops are formed with a continuous wire that is in the shape of a loop in the ground. The loop wire is energized thus creating a magnetic field. When the magnetic field is interrupted by a large mass of metal, its detector sends a message to the gate to open, close, stop or whatever function you select. If your gate is closed during business hours, you may need the basic ability for point of entry communication with those inside the facility that can open the gate. The most basic approach to this entry situation is an intercom system. Intercoms may be hard wired, radio frequency or Wi-Fi enabled. 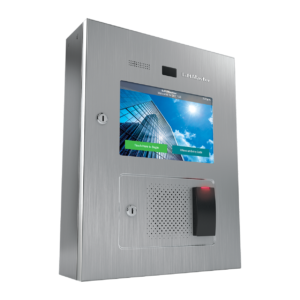 Basic intercoms will include the ability to not only communicate with those at the gate but a call button to initiate the conversation from the gate and a button to open the gate from within the facility. Intercom systems will include at least two components; one component installed at the gate and another unit installed within the facility. The next level up from the basic intercom is the telephone entry system. 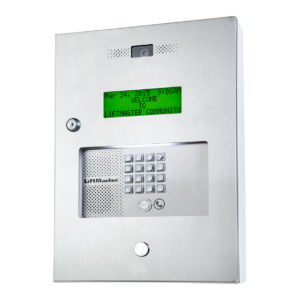 This system is advanced beyond the intercom system in its ability to connect point of entry communications with others via a phone number. Telephone entry systems include a component installed at the gate. This unit may be connected with a dedicated phone line, shared phone line or Wi-Fi enabled. The unit will include a “call button” that is programmed to call those authorized to open the gate. Those at the gate will communicate with others from the unit over the phone. Those on the phone will select one of the numbers on their keypad to open the gate. Telephone entry systems will also include a keypad for entrants to use a code to open the gate or select alternate authorized phone numbers. Telephone entry systems will typically also include some advanced features such as call waiting, call forwarding, one-time programmable entry codes, programmable time zones for the gate to be open, etc. The most advanced access control device is a computerized entry system. Computerized entry systems will include a primary unit that includes the circuitry for processing and storing information. Connected to this primary unit may be multiple secondary units that utilize the primary unit for validation and recording entry requests. Computerized entry systems will be connected via a data line or Wi-Fi. Programming may be completed remotely or at the unit via a laptop. Computerized entry systems allow you to control multiple points of entry that can include gates and doors. The system allows you to program each point of entry parameters and individual user parameters. Computerized entry systems will often have the same appearance and functionality as a telephone entry system but will also include more specific point of entry and user parameters, and high-level reporting functionality. Below are some examples of common access control sites that either fit a standalone or computerized programmable system. The facility is a food service manufacturing plant. Due to FDA regulations, it must be closed during business hours. The operation has several key employees, over 50 regular employees, scheduled services and non-scheduled deliveries. This facility will undoubtedly need an ability to communicate from the gate to those who have an ability to open the gate. It may not be practical to anticipate someone will be constantly present to allow access. In that event, you will definitely want to select a computerized entry system where you can preprogram access for each type of individual. Key employees will need access for after hours as they may be working long days. However, company leadership may want to know when these individuals are still coming and going. With 50 regular scheduled employees, the FDA mandates that you will have to regulate and record entry and departure for these employees. Scheduled services such as supplier deliveries and customer pick-ups should be controlled and recorded. Non-scheduled services such as UPS, Fed-Ex and repair services will not have access unless allowed entry by the facility. Another facility may be an equipment storage lot for a construction company. This facility should also be closed during the day. However, only a handful of employees may need access to the lot. In this event, a standalone keypad may be used to allow access. Once you have selected your gate, gate operator and access control devices; you are now ready to design your pedestrian safety and vehicle detection system. You are now ready to begin How To Select Your Automated Gate – Part 4 Providing the necessary and required safety components in support of your system.